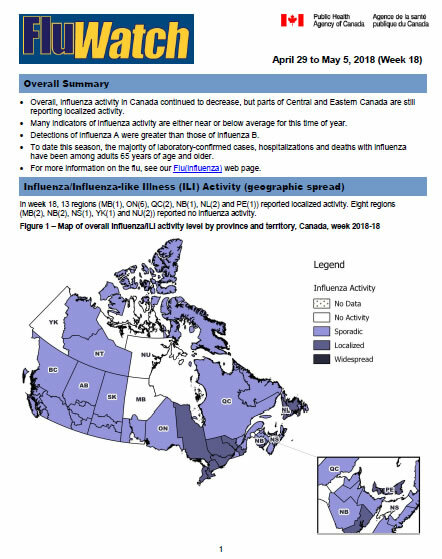 Overall influenza activity in Canada continued to decrease, but many parts of the country are still reporting localized activity. 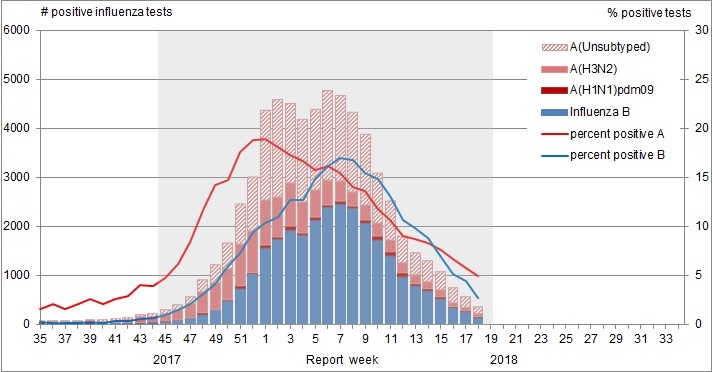 Two indicators of influenza activity (influenza-like illness and outbreaks) slightly increased from the previous week. Detections of influenza A were greater than those of influenza B. To date this season, the majority of laboratory-confirmed cases, hospitalizations and deaths with influenza have been among adults 65 years of age and older. For more information on the flu, see our Flu(influenza) web page. In week 15, one region in QC reported widespread activity and 23 regions (BC(1), AB(1), MB(2), ON(7), QC(3), NB(2), NL(3), NS(2), PE(1) and NT(1)) reported localized activity. 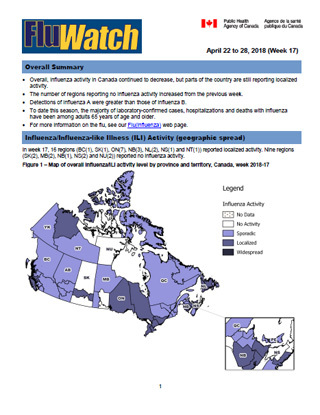 Note: Influenza/ILI activity levels, as represented on this map, are assigned and reported by Provincial and Territorial Ministries of Health, based on laboratory confirmations, sentinel ILI rates and reported outbreaks. Please refer to detailed definitions at the end of the report. Maps from previous weeks, including any retrospective updates, are available in the mapping feature found in the Weekly Influenza Reports. In week 15, the overall percentage of tests positive for influenza was 15%, a decrease from the previous week. Overall, laboratory detections of influenza are steadily decreasing. Influenza A accounted for 54% of influenza detections in week 15. Overall, laboratory detections of influenza are around the average for this time of year. 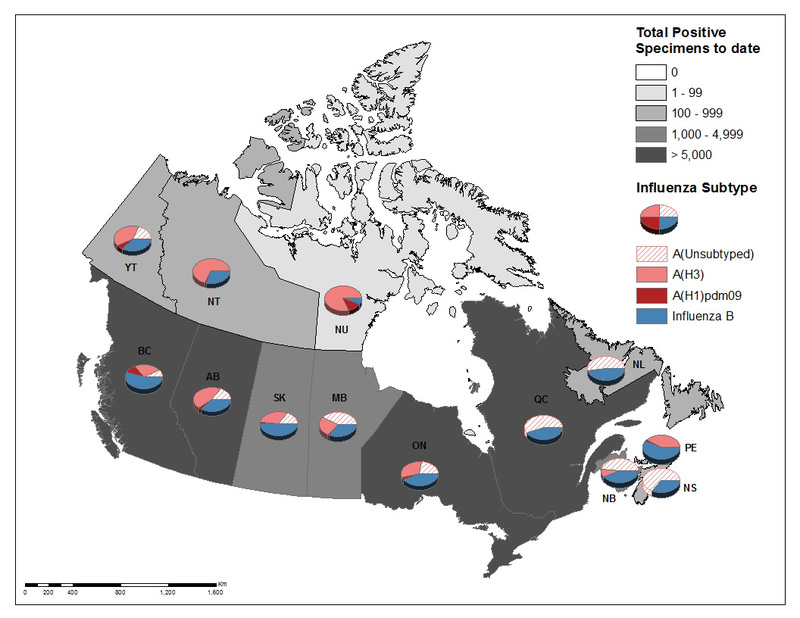 For data on other respiratory virus detections, see the Respiratory Virus Detections in Canada Report. The shaded area indicates weeks where the positivity rate was at least 5% and a minimum of 15 positive tests were observed, signalling the period of seasonal influenza activity. Figure 2 - Text Description To date this season, 62,062 laboratory-confirmed influenza detections have been reported, of which 56% have been influenza A. Influenza A(H3N2) has been the most common subtype detected this season, representing 91% of subtyped influenza A detections. For more detailed weekly and cumulative influenza data, see the text descriptions for Figures 2 and 3 or the Respiratory Virus Detections in Canada Report. Figure 3 - Text Description To date this season, detailed information on age and type/subtype has been received for 50,204 laboratory-confirmed influenza cases (Table 1). Adults 65 years of age and older represent the largest proportion of cases overall (50%), and among cases of influenza A(H3N2) (59%) and influenza B (48%). Adults aged 20-64 represent 32% of cases overall and 29% of influenza A(H3N2) and 34% of influenza B cases. Although much smaller in numbers (883), the majority of influenza A(H1N1)pdm09 cases are among adults less than 65 years of age, with adults aged 20-64 and children 0-19 years accounting for 54% and 31% of cases respectively. 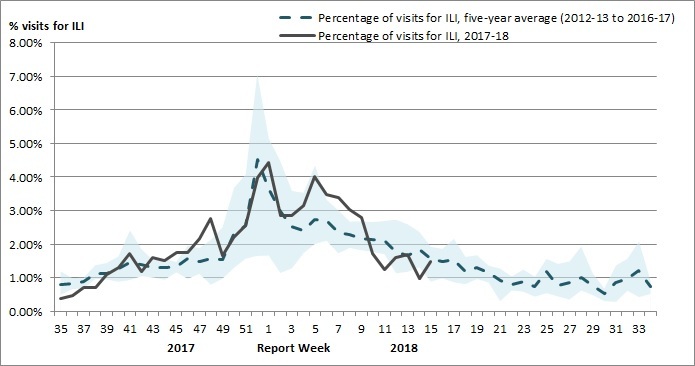 In week 15, 1.5% of visits to healthcare professionals were due to influenza-like illness (ILI); a decrease from the previous week. FluWatchers is a participatory ILI surveillance system that relies on weekly voluntary submissions of syndromic information from Canadians across Canada. In week 15, 1,315 participants reported to FluWatchers, of which 2% reported symptoms of cough and fever, and 41% of these consulted a healthcare professional. Among participants who reported cough and fever, 73% reported days missed from work or school, resulting in a combined total of 59 missed days of work or school. In week 15, 44 laboratory-confirmed outbreaks of influenza were reported. Among the reported influenza outbreaks, 31 were reported in long-term care facilities (LTC), three in hospitals, and 10 in other settings. In addition, two ILI outbreaks were reported in schools. Among the 35 outbreaks with influenza type/subtype reported, 22 (63%) were associated with influenza A, 12 (34%) were associated with influenza B and one outbreak (3%) was associated with a mix of influenza A and B. To date this season, 1,751 influenza/ILI outbreaks have been reported, of which 1,081 (62%) occurred in LTC facilities. Among the 1,500 outbreaks for which the influenza type/subtype was reported, 825 (55%) were associated with influenza A and 606 (40%) were associated with influenza B, and 69 (5%) were associated with a mix of A and B. 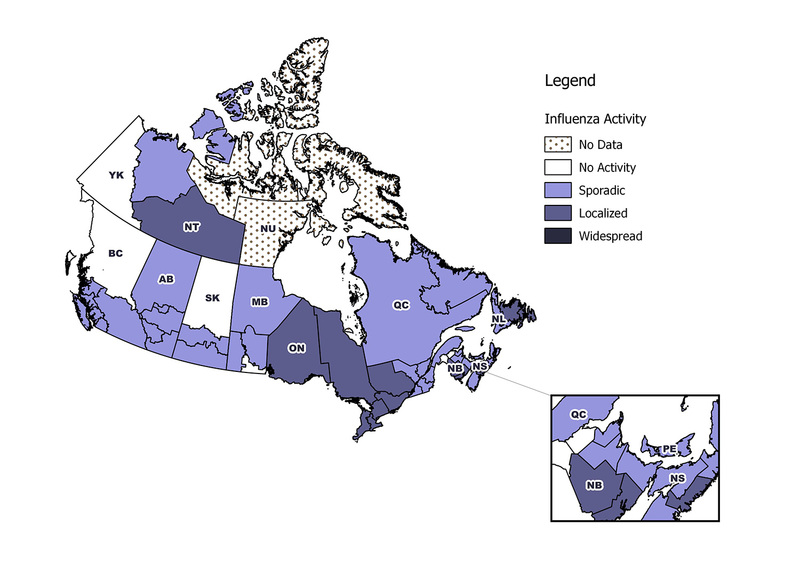 To date this season, 4,835 influenza-associated hospitalizations were reported by participating provinces and territoriesFootnote1. Among the hospitalizations, 3,260 (67%) were associated with influenza A, and 3,190 cases (66%) were in adults 65 years of age or older. Additionally, 487 ICU admissions and 265 deaths have been reported to date. Adults aged 65 years of age or older accounted for the greatest proportion of ICU cases (44%), followed by adults aged 20-64 (39%). Adults aged 65 years of age or older accounted the majority of deaths (85%). Figure 6 - Text Description Figure 6 note 1 Influenza-associated hospitalizations are reported by NL, PE, NS, NB, MB, AB, YT and NT. Only hospitalizations that require intensive medical care are reported by SK. In week 15, 12 laboratory-confirmed influenza-associated pediatric (≤16 years of age) hospitalizations were reported by the Immunization Monitoring Program Active (IMPACT) network. Influenza A accounted for 67% of the hospitalizations. 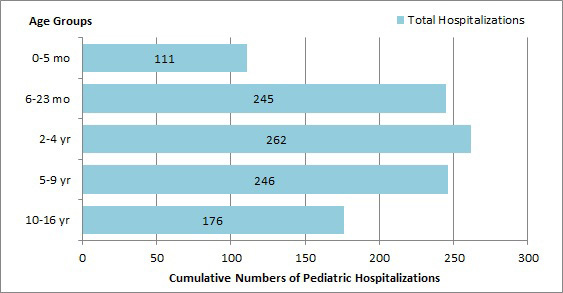 Pediatric hospitalizations have been on a general decline since week 07. The number of weekly reported hospitalizations has finally fallen to levels that are near the seven-season average. To date this season, 1,034 pediatric hospitalizations have been reported by the IMPACT network, 643 (62%) of which were associated with influenza A. Children 0-23 months accounted for the largest proportion of influenza A hospitalizations (40%). Among the 391 hospitalizations due to influenza B, children 5-9 years accounted for the largest proportion of cases (31%). Additionally, 175 ICU admissions and nine deaths have been reported to date. Children aged 0-23 months accounted for the greatest proportion of ICU cases (29%), followed by children aged 5-9 years (26%). Among the ICU cases with available information, 63% were due to influenza A and approximately 47% had no reported previous or concurrent medical conditions. All but one reported deaths were among children over the age of two. During the 2017-18 influenza season, the National Microbiology Laboratory (NML) has characterized 3,146 influenza viruses [1,377 A(H3N2), 239 A(H1N1)pdm09 and 1,530 B viruses] that were received from Canadian laboratories. Among influenza viruses characterized by hemagglutination inhibition (HI) assay during the 2017-18 season, most viruses were antigenically similar to the cell-culture propagated reference strains recommended by WHO. A/Hong Kong/4801/2014-like 277 Viruses antigenically similar to A/Hong Kong/4801/2014, the A(H3N2) component of the 2017-18 Northern Hemisphere's trivalent and quadrivalent vaccine. A/Michigan/45/2015-like 239 Viruses antigenically similar to A/Michigan/45/2015, the A(H1N1)pdm09 component of the 2017-18 Northern Hemisphere's trivalent and quadrivalent influenza vaccine. B/Brisbane/60/2008-like (Victoria lineage) 16 Viruses antigenically similar to B/Brisbane/60/2008. B/Brisbane/60/2008 is the influenza B component of the 2017-18 Northern Hemisphere's trivalent and quadrivalent influenza vaccine. (Victoria lineage) 48 These B/Victoria lineage viruses reacted poorly with antisera raised against cell-propagated B/Brisbane/60/2008, suggesting some antigenic differences. (Yamagata lineage) 1,466 Viruses antigenically similar to B/Phuket/3073/2013, the additional influenza B component of the 2017-18 Northern Hemisphere quadrivalent influenza vaccine. During the 2017-18 season, 1,021 A(H3N2) viruses did not grow to sufficient titers for antigenic characterization by HI assay. Therefore, genetic characterization was performed to determine to which genetic group they belong. Sequence analysis showed that 913 A(H3N2) viruses belonged to genetic group 3C.2a, 106 viruses belonged to subclade 3C.2a1 and two viruses belonged to the clade 3C.3a. Additionally, of the 356 influenza A(H3N2) viruses that were characterized antigenically as similar to A/Hong Kong/4801/2014, 245 belonged to genetic group 3C.2a and 25 viruses belonged to subclade 3C.2a1. The 79 viruses that showed reduced titer to A/Hong Kong/4801/2014 belonged to genetic clade 3C.3a. Sequencing is pending for the remaining seven isolates. A/Hong Kong/4801/2014-like virus belongs to genetic group 3C.2a and is the influenza A/H3N2 component of the 2017-18 Northern Hemisphere influenza vaccine. Among the viruses characterized antigenically as having reduced titer to ferret antisera produced against cell-propagated B/Brisbane/60/2008, sequence analysis showed that 47 viruses had a two amino acid deletion in the HA gene. Sequencing is pending for the remaining virus isolate. Overall, influenza activity in Canada continued to decrease, but parts of the country are still reporting localized activity. All indicators of influenza activity have either decreased or remained similar to the previous week. In week 16, 14 regions ( ON(7), QC(1), NB(2), NL(2), NS(1) and NT(1)) reported localized activity. Six regions reported no influenza activity. 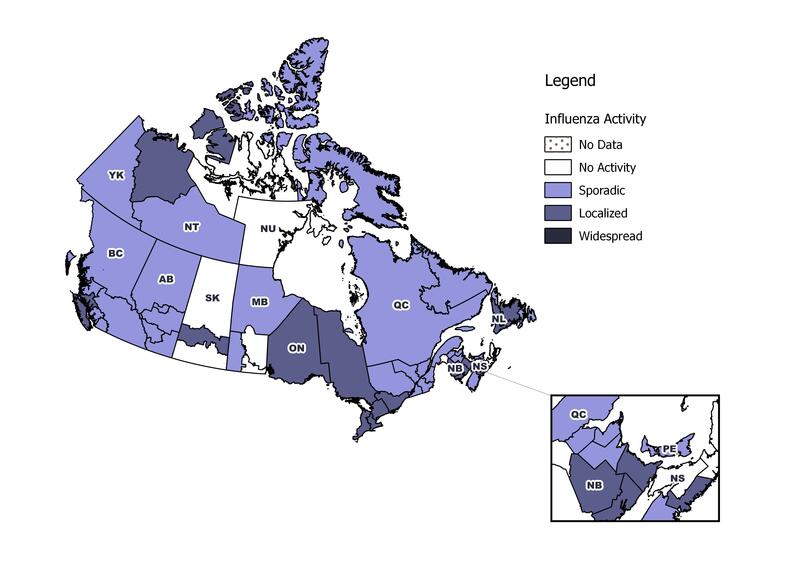 Figure 1 - Map of overall influenza/ILI activity level by province and territory, Canada, week 2018-16 Note: Influenza/ILI activity levels, as represented on this map, are assigned and reported by Provincial and Territorial Ministries of Health, based on laboratory confirmations, sentinel ILI rates and reported outbreaks. Please refer to detailed definitions at the end of the report. Maps from previous weeks, including any retrospective updates, are available in the mapping feature found in the Weekly Influenza Reports. In week 16, the overall percentage of tests positive for influenza was 12%, a decrease from the previous week. Overall, laboratory detections of influenza are steadily decreasing. In week 16, 719 positive influenza tests were reported, down from 955 tests reported in week 15. Influenza A accounted for 57% of influenza detections in week 16. Figure 2 - Text descriptionTo date this season, 62,933 laboratory-confirmed influenza detections have been reported, of which 56% have been influenza A. Influenza A(H3N2) has been the most common subtype detected this season, representing 91% of subtyped influenza A detections. For more detailed weekly and cumulative influenza data, see the text descriptions for Figures 2 and 3 or the Respiratory Virus Detections in Canada Report. Figure 3 - Text descriptionTo date this season, detailed information on age and type/subtype has been received for 50,729 laboratory-confirmed influenza cases (Table 1). Adults 65 years of age and older represent the largest proportion of cases overall (50%), and among cases of influenza A(H3N2) (59%) and influenza B (48%). Adults aged 20-64 represent 32% of cases overall and 29% of influenza A(H3N2) and 34% of influenza B cases. Although much smaller in numbers (898), the majority of influenza A(H1N1)pdm09 cases are among adults less than 65 years of age, with adults aged 20-64 and children 0-19 years accounting for 54% and 30% of cases respectively. In week 16, 1.7% of visits to healthcare professionals were due to influenza-like illness (ILI); a decrease from the previous week. In week 16, 1,314 participants reported to FluWatchers, of which 1% reported symptoms of cough and fever, and 19% of these consulted a healthcare professional. Among participants who reported cough and fever, 88% reported days missed from work or school, resulting in a combined total of 43 missed days of work or school. In week 16, 14 laboratory-confirmed outbreaks of influenza were reported. Among the reported influenza outbreaks, nine were reported in long-term care facilities (LTC), one in a hospital, and four in other settings. In addition, one ILI outbreak was reported in a school. Among the 11 outbreaks with influenza type/subtype reported, eight (73%) were associated with influenza A and three (27%) were associated with influenza B. To date this season, 1,767 influenza/ILI outbreaks have been reported, of which 1,091 (62%) occurred in LTC facilities. Among the 1,512 outbreaks for which the influenza type/subtype was reported, 834 (55%) were associated with influenza A and 609 (40%) were associated with influenza B, and 69 (5%) were associated with a mix of A and B. To date this season, 4,928 influenza-associated hospitalizations were reported by participating provinces and territoriesFootnote1. Among the hospitalizations, 3,305 (67%) were associated with influenza A, and 3,232 cases (66%) were in adults 65 years of age or older. Additionally, 496 ICU admissions and 271 deaths have been reported to date. Adults aged 65 years of age or older accounted for the greatest proportion of ICU cases (44%), followed by adults aged 20-64 (40%). Adults aged 65 years of age or older accounted the majority of deaths (85%). Figure 6 - Text descriptionFigure 6 note 1Influenza-associated hospitalizations are reported by NL, PE, NS, NB, MB, AB, YT and NT. 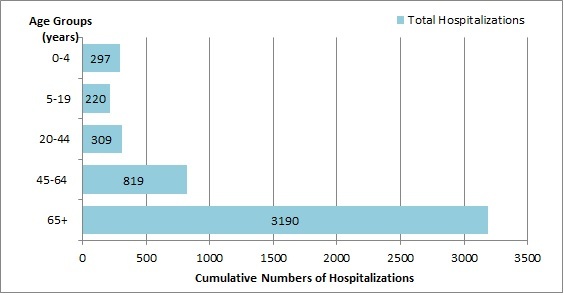 Only hospitalizations that require intensive medical care are reported by SK. In week 16, seven laboratory-confirmed influenza-associated pediatric (≤16 years of age) hospitalizations were reported by the Immunization Monitoring Program Active (IMPACT) network. Influenza A accounted for 57% of the hospitalizations. Pediatric hospitalizations have been on a general decline since week 07. The number of weekly reported hospitalizations has finally fallen to levels that are below the seven-season average. To date this season, 1,040 pediatric hospitalizations have been reported by the IMPACT network, 645 (62%) of which were associated with influenza A. Children 0-23 months accounted for the largest proportion of influenza A hospitalizations (40%). Among the 395 hospitalizations due to influenza B, children 5-9 years accounted for the largest proportion of cases (31%). Additionally, 177 ICU admissions and nine deaths have been reported to date. Children aged 0-23 months accounted for the greatest proportion of ICU cases (29%), followed by children aged 5-9 years (30%). Among the ICU cases with available information, 25% were due to influenza A and approximately 46% had no reported previous or concurrent medical conditions. All but one reported deaths were among children over the age of two. During the 2017-18 influenza season, the National Microbiology Laboratory (NML) has characterized 3,317 influenza viruses [1,420 A(H3N2), 247 A(H1N1)pdm09 and 1,650 B viruses] that were received from Canadian laboratories. A/Hong Kong/4801/2014-like 287 Viruses antigenically similar to A/Hong Kong/4801/2014, the A(H3N2) component of the 2017-18 Northern Hemisphere's trivalent and quadrivalent vaccine. A/Michigan/45/2015-like 247 Viruses antigenically similar to A/Michigan/45/2015, the A(H1N1)pdm09 component of the 2017-18 Northern Hemisphere's trivalent and quadrivalent influenza vaccine. (Victoria lineage) 20 Viruses antigenically similar to B/Brisbane/60/2008. (Yamagata lineage) 1581 Viruses antigenically similar to B/Phuket/3073/2013, the additional influenza B component of the 2017-18 Northern Hemisphere quadrivalent influenza vaccine. During the 2017-18 season, 1,051 A(H3N2) viruses did not grow to sufficient titers for antigenic characterization by HI assay. Therefore, genetic characterization was performed to determine to which genetic group they belong. Sequence analysis showed that 942 A(H3N2) viruses belonged to genetic group 3C.2a, 107 viruses belonged to subclade 3C.2a1 and two viruses belonged to the clade 3C.3a. Additionally, of the 369 influenza A(H3N2) viruses that were characterized antigenically as similar to A/Hong Kong/4801/2014, 251 belonged to genetic group 3C.2a and 26 viruses belonged to subclade 3C.2a1. The 82 viruses that showed reduced titer to A/Hong Kong/4801/2014 belonged to genetic clade 3C.3a. Sequencing is pending for the remaining 10 isolates. Among the viruses characterized antigenically as having reduced titer to ferret antisera produced against cell-propagated B/Brisbane/60/2008, sequence analysis showed that 48 viruses had a two amino acid deletion in the HA gene. Sequencing is pending for the remaining virus isolate. The number of regions reporting no influenza activity increased from the previous week. In week 17, 16 regions (BC(1), SK(1), ON(7), NB(3), NL(2), NS(1) and NT(1)) reported localized activity. 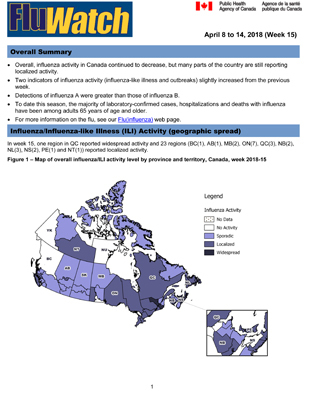 Nine regions (SK(2), MB(2), NB(1), NS(2) and NU(2)) reported no influenza activity. Figure 1 - Map of overall influenza/ILI activity level by province and territory, Canada, week 2018-17 Note: Influenza/ILI activity levels, as represented on this map, are assigned and reported by Provincial and Territorial Ministries of Health, based on laboratory confirmations, sentinel ILI rates and reported outbreaks. Please refer to detailed definitions at the end of the report. Maps from previous weeks, including any retrospective updates, are available in the mapping feature found in the Weekly Influenza Reports. In week 17, the percentage of tests positive for influenza was 10%, a decrease from the previous week. Laboratory detections of influenza are steadily decreasing. In week 17, 526 positive influenza tests were reported, down from 719 tests reported in week 16. 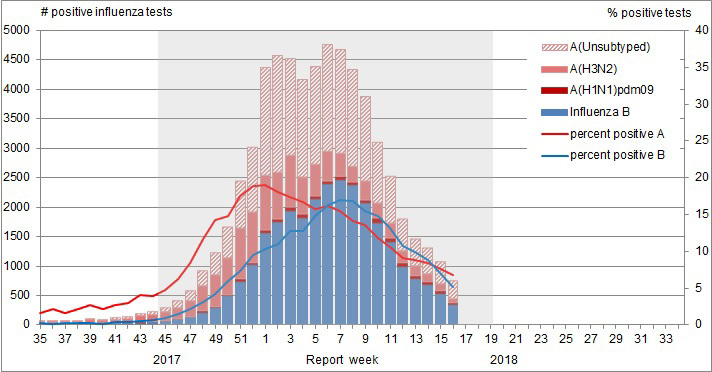 Influenza A accounted for 57% of influenza detections in week 17. Figure 2 - Text description To date this season, 63,476 laboratory-confirmed influenza detections have been reported, of which 56% have been influenza A. Influenza A(H3N2) has been the most common subtype detected this season, representing 90% of subtyped influenza A detections. For more detailed weekly and cumulative influenza data, see the text descriptions for Figures 2 and 3 or the Respiratory Virus Detections in Canada Report. Figure 3 - Text description To date this season, detailed information on age and type/subtype has been received for 51,076 laboratory-confirmed influenza cases (Table 1). Adults 65 years of age and older represent the largest proportion of cases overall (50%), and among cases of influenza A(H3N2) (59%) and influenza B (48%). Adults aged 20-64 represent 32% of cases overall and 29% of influenza A(H3N2) and 34% of influenza B cases. Although much smaller in numbers (910), the majority of influenza A(H1N1)pdm09 cases are among adults less than 65 years of age, with adults aged 20-64 and children 0-19 years accounting for 54% and 30% of cases respectively. In week 17, 2.0% of visits to healthcare professionals were due to influenza-like illness (ILI). In week 17, 1,319 participants reported to FluWatchers, of which 2% reported symptoms of cough and fever, and 10% of these consulted a healthcare professional. Among participants who reported cough and fever, 80% reported days missed from work or school, resulting in a combined total of 35 missed days of work or school. In week 17, nine laboratory-confirmed outbreaks of influenza were reported. Among the reported influenza outbreaks, six were reported in long-term care facilities (LTC) and three in other settings. In addition, one ILI outbreak was reported in a school. Among the seven outbreaks with influenza type/subtype reported, five (71%) were associated with influenza B and two (29%) were associated with influenza A. To date this season, 1,778 influenza/ILI outbreaks have been reported, of which 1,098 (62%) occurred in LTC facilities. Among the 1,520 outbreaks for which the influenza type/subtype was reported, 836 (55%) were associated with influenza A and 615 (40%) were associated with influenza B, and 69 (5%) were associated with a mix of A and B. To date this season, 5,004 influenza-associated hospitalizations were reported by participating provinces and territoriesFootnote1. Among the hospitalizations, 3,337 (67%) were associated with influenza A, and 3,275 cases (65%) were in adults 65 years of age or older. Additionally, 504 ICU admissions and 278 deaths have been reported to date. Adults aged 65 years of age or older accounted for the greatest proportion of ICU cases (44%), followed by adults aged 20-64 (40%). Adults aged 65 years of age or older accounted the majority of deaths (85%). In week 17, 12 laboratory-confirmed influenza-associated pediatric (≤16 years of age) hospitalizations were reported by the Immunization Monitoring Program Active (IMPACT) network. Influenza A accounted for 67% of the hospitalizations. Pediatric hospitalizations have been on a general decline since week 07. The number of weekly reported hospitalizations are below the seven-season average. 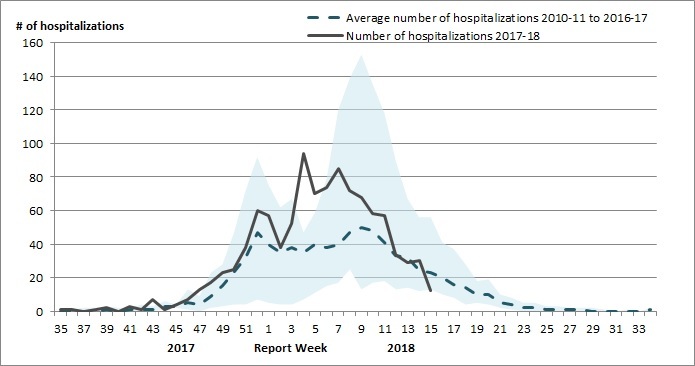 To date this season, 1,054 pediatric hospitalizations have been reported by the IMPACT network, 654 (62%) of which were associated with influenza A. Children 0-23 months accounted for the largest proportion of influenza A hospitalizations (39%). Among the 400 hospitalizations due to influenza B, children 5-9 years accounted for the largest proportion of cases (31%). Additionally, 179 ICU admissions and nine deaths have been reported to date. Children aged 0-23 months accounted for the greatest proportion of ICU cases (30%), followed by children aged 5-9 years (26%). Among the ICU cases with available information, 63% were due to influenza A and approximately 47% had no reported previous or concurrent medical conditions. All but one reported deaths were among children over the age of two. During the 2017-18 influenza season, the National Microbiology Laboratory (NML) has characterized 3,358 influenza viruses [1,426 A(H3N2), 252 A(H1N1)pdm09 and 1,680 B viruses] that were received from Canadian laboratories. A/Hong Kong/4801/2014-like 291 Viruses antigenically similar to A/Hong Kong/4801/2014, the A(H3N2) component of the 2017-18 Northern Hemisphere's trivalent and quadrivalent vaccine. Reduced titer to A/Hong Kong/4801/2014 84 These A(H3N2) viruses reacted poorly with antisera raised against cell-propagated A/Hong Kong/4801/2014, suggesting some antigenic differences. A/Michigan/45/2015-like 252 Viruses antigenically similar to A/Michigan/45/2015, the A(H1N1)pdm09 component of the 2017-18 Northern Hemisphere's trivalent and quadrivalent influenza vaccine. (Victoria lineage) 20 Viruses antigenically similar to B/Brisbane/60/2008. B/Brisbane/60/2008 is the influenza B component of the 2017-18 Northern Hemisphere’s trivalent and quadrivalent influenza vaccine. (Victoria lineage) 51 These B/Victoria lineage viruses reacted poorly with antisera raised against cell-propagated B/Brisbane/60/2008, suggesting some antigenic differences. (Yamagata lineage) 1609 Viruses antigenically similar to B/Phuket/3073/2013, the additional influenza B component of the 2017-18 Northern Hemisphere quadrivalent influenza vaccine. Additionally, of the 291 influenza A(H3N2) viruses that were characterized antigenically as similar to A/Hong Kong/4801/2014, 265 belonged to genetic group 3C.2a and 26 viruses belonged to subclade 3C.2a1. The 84 viruses that showed reduced titer to A/Hong Kong/4801/2014 belonged to genetic clade 3C.3a. Among the viruses characterized antigenically as having reduced titer to ferret antisera produced against cell-propagated B/Brisbane/60/2008, sequence analysis showed that 49 viruses had a two amino acid deletion in the HA gene. Sequencing is pending for the remaining two virus isolates. Overall, influenza activity in Canada continued to decrease, but parts of Central and Eastern Canada are still reporting localized activity. Many indicators of influenza activity are either near or below average for this time of year. In week 18, 13 regions (MB(1), ON(6), QC(2), NB(1), NL(2) and PE(1)) reported localized activity. 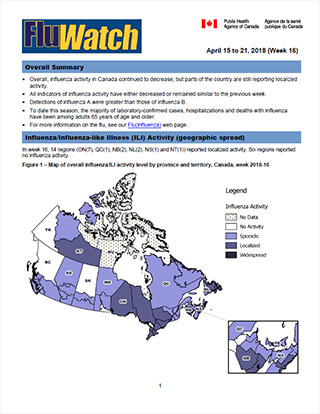 Eight regions (MB(2), NB(2), NS(1), YK(1) and NU(2)) reported no influenza activity. 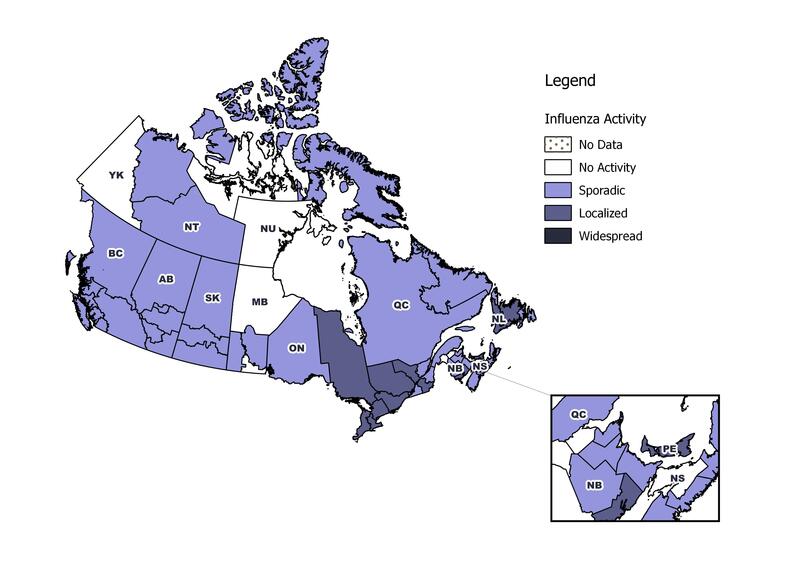 Figure 1 - Map of overall influenza/ILI activity level by province and territory, Canada, week 2018-18 Note: Influenza/ILI activity levels, as represented on this map, are assigned and reported by Provincial and Territorial Ministries of Health, based on laboratory confirmations, sentinel ILI rates and reported outbreaks. Please refer to detailed definitions at the end of the report. Maps from previous weeks, including any retrospective updates, are available in the mapping feature found in the Weekly Influenza Reports. In week 18, the percentage of tests positive for influenza was 8%, a decrease from the previous week. Laboratory detections of influenza are steadily decreasing. In week 18, 367 positive influenza tests were reported, down from 526 tests reported in week 17. Influenza A accounted for 66% of influenza detections in week 18. Figure 2 - Text description To date this season, 63,853 laboratory-confirmed influenza detections have been reported, of which 56% have been influenza A. Influenza A(H3N2) has been the most common subtype detected this season, representing 90% of subtyped influenza A detections. For more detailed weekly and cumulative influenza data, see the text descriptions for Figures 2 and 3 or the Respiratory Virus Detections in Canada Report. Figure 3 - Text description To date this season, detailed information on age and type/subtype has been received for 51,313 laboratory-confirmed influenza cases (Table 1). Adults 65 years of age and older represent the largest proportion of cases overall (50%), and among cases of influenza A(H3N2) (59%) and influenza B (48%). Adults aged 20-64 represent 32% of cases overall and 29% of influenza A(H3N2) and 34% of influenza B cases. Although much smaller in numbers (933), the majority of influenza A(H1N1)pdm09 cases are among adults less than 65 years of age, with adults aged 20-64 and children 0-19 years accounting for 53% and 31% of cases respectively. In week 18, 1.5% of visits to healthcare professionals were due to influenza-like illness (ILI). In week 18, 1,270 participants reported to FluWatchers, of which 1% reported symptoms of cough and fever, and 0% of these consulted a healthcare professional. Among participants who reported cough and fever, 75% reported days missed from work or school, resulting in a combined total of 36 missed days of work or school. FluWatchers surveillance has ended for the 2017-18 season. In week 18, 11 laboratory-confirmed outbreaks of influenza were reported. Among the reported influenza outbreaks, four were reported in long-term care facilities (LTC), three in hospitals and four in other settings. Among the ten outbreaks with influenza type/subtype reported, seven (70%) were associated with influenza A, two (20%) were associated with influenza B and one outbreak was associated with a mix or influenza A and B (10%). To date this season, 1,789 influenza/ILI outbreaks have been reported, of which 1,102 (62%) occurred in LTC facilities. Among the 1,530 outbreaks for which the influenza type/subtype was reported, 843 (55%) were associated with influenza A and 617 (40%) were associated with influenza B, and 70 (5%) were associated with a mix of A and B. To date this season, 5,059 influenza-associated hospitalizations were reported by participating provinces and territoriesFootnote1. Among the hospitalizations, 3,373 (67%) were associated with influenza A, and 3,308 cases (65%) were in adults 65 years of age or older. Additionally, 508 ICU admissions and 290 deaths have been reported to date. Adults aged 65 years of age or older accounted for the greatest proportion of ICU cases (44%), followed by adults aged 20-64 (40%). Adults aged 65 years of age or older accounted the majority of deaths (86%). In week 18, 10 laboratory-confirmed influenza-associated pediatric (≤16 years of age) hospitalizations were reported by the Immunization Monitoring Program Active (IMPACT) network. Influenza A accounted for 80% of the hospitalizations. Pediatric hospitalizations have been on a general decline since week 07. The number of weekly reported hospitalizations are below the seven-season average. To date this season, 1,066 pediatric hospitalizations have been reported by the IMPACT network, 663 (62%) of which were associated with influenza A. Children 0-23 months accounted for the largest proportion of influenza A hospitalizations (39%). Among the 403 hospitalizations due to influenza B, children 5-9 years accounted for the largest proportion of cases (31%). Additionally, 183 ICU admissions and nine deaths have been reported to date. Children aged 0-23 months accounted for the greatest proportion of ICU cases (31%), followed by children aged 5-9 years (26%). Among the ICU cases with available information, 63% were due to influenza A and approximately 46% had no reported previous or concurrent medical conditions. All but one reported deaths were among children over the age of two. During the 2017-18 influenza season, the National Microbiology Laboratory (NML) has characterized 3,571 influenza viruses [1,478 A(H3N2), 287 A(H1N1)pdm09 and 1,806 B viruses] that were received from Canadian laboratories. A/Hong Kong/4801/2014-like 296 Viruses antigenically similar to A/Hong Kong/4801/2014, the A(H3N2) component of the 2017-18 Northern Hemisphere's trivalent and quadrivalent vaccine. Reduced titer to A/Hong Kong/4801/2014 88 These A(H3N2) viruses reacted poorly with antisera raised against cell-propagated A/Hong Kong/4801/2014, suggesting some antigenic differences. A/Michigan/45/2015-like 287 Viruses antigenically similar to A/Michigan/45/2015, the A(H1N1)pdm09 component of the 2017-18 Northern Hemisphere's trivalent and quadrivalent influenza vaccine. (Victoria lineage) 24 Viruses antigenically similar to B/Brisbane/60/2008. B/Brisbane/60/2008 is the influenza B component of the 2017-18 Northern Hemisphere’s trivalent and quadrivalent influenza vaccine. (Victoria lineage) 54 These B/Victoria lineage viruses reacted poorly with antisera raised against cell-propagated B/Brisbane/60/2008, suggesting some antigenic differences. (Yamagata lineage) 1728 Viruses antigenically similar to B/Phuket/3073/2013, the additional influenza B component of the 2017-18 Northern Hemisphere quadrivalent influenza vaccine. During the 2017-18 season, 1,094 A(H3N2) viruses did not grow to sufficient titers for antigenic characterization by HI assay. Therefore, genetic characterization was performed to determine to which genetic group they belong. Sequence analysis showed that 981 A(H3N2) viruses belonged to genetic group 3C.2a, 111 viruses belonged to subclade 3C.2a1 and two viruses belonged to the clade 3C.3a. Additionally, of the 384 influenza A(H3N2) viruses that were antigenically characterized , 267 belonged to genetic group 3C.2a and 26 viruses belonged to subclade 3C.2a1. The 88 viruses that showed reduced titer to A/Hong Kong/4801/2014 belonged to genetic clade 3C.3a. Sequencing is pending for the remaining three virus isolates. Of the 78 influenza B viruses characterized as B/ B/Brisbane/60/2008-like, 24 viruses were antigenically similar to the vaccine strain B/Brisbane/60/2008. Among the viruses characterized antigenically as having reduced titer to ferret antisera produced against cell-propagated B/Brisbane/60/2008, sequence analysis showed that 49 viruses had a two amino acid deletion in the HA gene. Sequencing is pending for the remaining five virus isolates. All times are GMT-5. This page was generated at 04:27 AM.